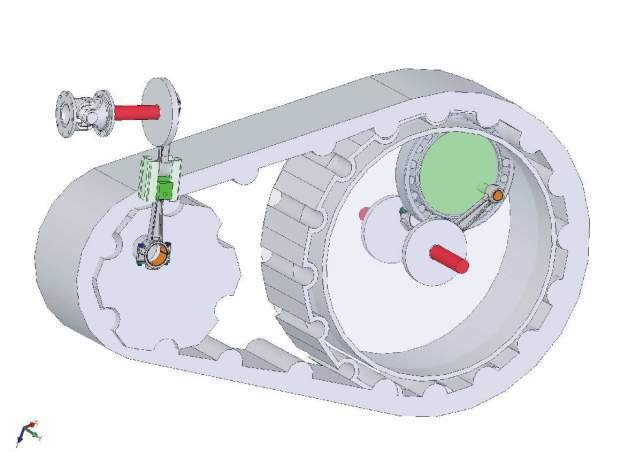 New rod differential at animations Solid Works when one axle stop. Differential Gear. It's first design. Without any cogged gear, and if we will employ oiled lubrication solid ball bearing (closed), then work is possible without oil oiling .Polyurethane HD belt. I am some, that such will work without that noises differential . efficiency are better in my solutions. I judge it for it, that warm is sometimes in very "noisy" differ oil. However, they do not heat small on practically cardan ball bearings. Striped transmission too not see to hot. I think , so efficiency are 3% better. Well Andrew, welcome to Ten Tenths! Andrew, help us with the direct link with sportscars here? Well it looks like it is a non lubricated (dry) belt driven differential that is a semi direct drive that would allow a car the benefit of limited slip yet give it motive drive to get back to the pits if either side was made inop., broken shaft,lost wheel etc. But that is just a stab in the dark!! On races in LeMans farther are using these heavy valves ?? Yeah I just wanted to clarify this matter of the weight "be greater" for my solution. She is very often raised, as the lack of the advantage of my engine. And it is of course the untrue, but intellectual ‘box’ are ordering to think so, that it is a truth. And I other side Piston , rod, pin,and two rings diameter 38 mm , what is a greater dimension than a valve has him considerably. In spite of it, in the photograph done by me clearly one can see, that much he is heavier unite the valve. 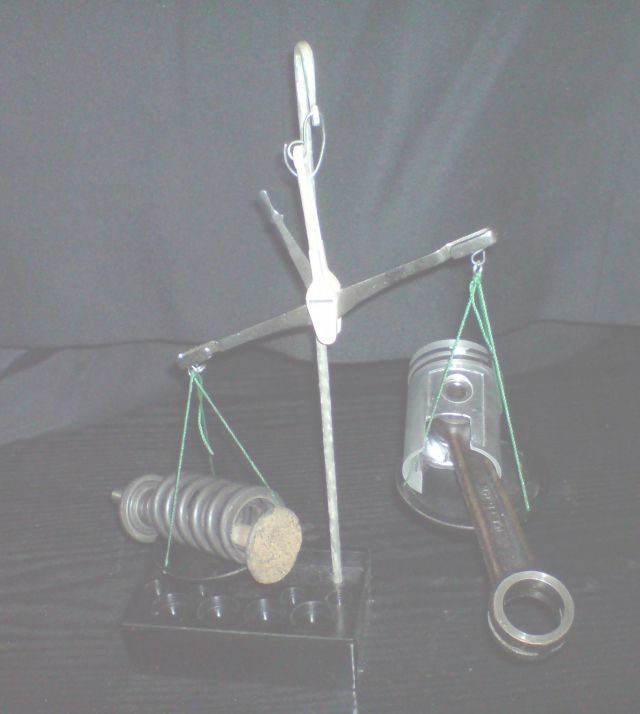 If not you believe, go to scrap, find and take the piston with the connecting rod from the old lawnmower and about the same diameter valve with the spring from some car engine.. I think that you will be not having to use scales, because after taken into one hand piston, and into second of valve, you will be sure knew what was heavier. If now will add to the moving weight of valve ( the reciprocating mass) rocker arm, mecanical regulations of clearance valve (or very heavy hydraulic valve lifter( tappet)) taped (ewentualy push rod). 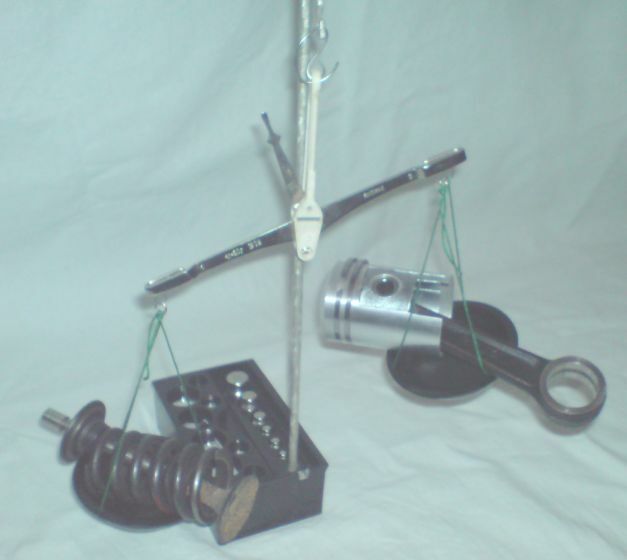 it sure it will turn out that the weight of the valve is twice as bigger from set piston –rod same diameter. However, that's not all in relation to the weight. He is reaching to valves static weight so things like valve quide in heads, and rocker arm shaft. 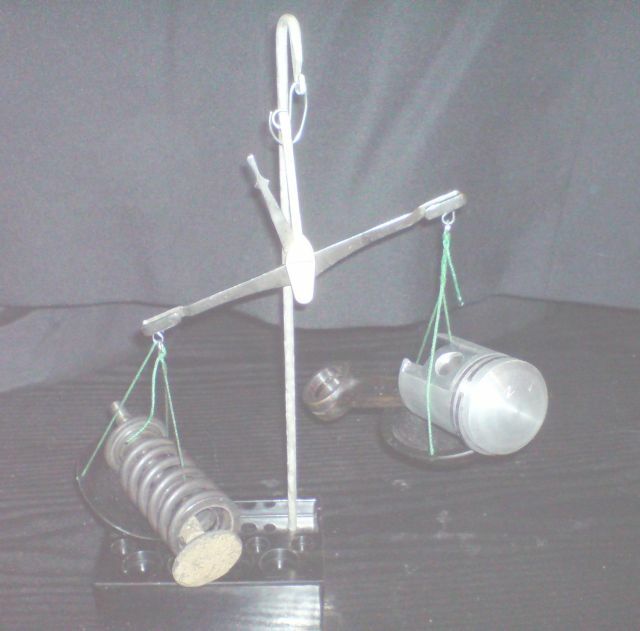 One should also add the weight not chosen materials of the head, about the diameter piston. and lengths of his cylinder. For lowering static mass of the engine one should add the lack bolts for screwing the head, since altogether cylinders around wit cylinder valves it is possible easily to make one-piece steel out, and then aren't needed bolts to the head together with threaded with their nests. Adding this static reducing the weight, we receive altogether the piston valve is three times lighter than the traditional valve.!! And greatest loss of engine mass.Piston valves mass, at the same diameter like valves, they cause that he is arriving about 15 % of jumping volume of the engine. That is mass of the engine is also reducing about 15 %. In net part all about termal efficiency.I am only attention, so most important in combustion chamber, are TEMPERATURE elements. Poped Valve : weight only poped,springs,taper all 176,5 Gram. diameter open gap 28,5 mm. Diameter 38 mm - it's 25% more poped in diameter( some weight are they grow with the square of the radius) . Gap 38 mm . Shows it has become with polished rod on photo .It color has been changed on result of temperature on bearing on blue .Of course, at present everything is exchanged and the engine is sending for the demonstration of his work. Still supposedly in more civilized countries and in the more refined way they took care, so that in this my account I lack money, so I don't have a lot for the execution. But there are also people which for free are supporting my idea. Above beautiful for me one Greek inventor did animated films, most probably also not for so that I keep it under my bed at home. Kadenacky was a forerunner . I designed at first time my prototype of engine 600 cm^ 3, to parameters 100 HP. And there is only a wonderful trick here: the Engine surprised me favourably, and has 2,5 times of more power than I established .... Neat trick !!! Ahh, I get this. I could explain to you all, but me and Andrew have sworn to a secret agreement which would involve our left ear and right little finger being removed with toothpicks by a group of Lithuanian bankers. whether can carry animated version of our explanation out with a view to better understanding the issue ?? As a friend of innovation, I commend you on your very beneficial work that can make Le Mans-loving mankind very happy. Your great engineering, nay, physics genius is clear. What a wonderful thing it will be if it can be consumated with great adiabatic principles, for the betterment of the race - to say nothing of races. I humbly would like to suggest you get in contact with my friend, Alberto Soloroli, diplomate in engineering, University of Toronto (though they lost his records) and also committee chairman of ASTM (unfortunately they also lost his records). He, like you, is a genius, and like you, unrecognized by his peers. But for you, very important, Mr. Soloroli, (known to his friends as "Solo Al") holds millions of shares of the conglomerate "Infinite Networks," and is very well acquanted in the Karamouzi Bank & Trust Ltd., Republic of Cameroon, which has issued him a $25 million dollar letter of credit against, 28 million shares of Infinite Networks (INNX), and reportedly, its subsidiary, "Cosmic Energy." A delegation of Atlanteans arrived suddenly last month and requested to meet with (Tommy) Remengesau (Palau’s President), said Billy Kuartei, chief of staff for the president. Kuartei said he cautiously set up a meeting with the president’s senior legal counsel, the attorney general and himself instead. The proposal was for a low-interest loan of up to $100 million – the catch (there always is one, you know) was that Palau would have to pay a fee of 2 percent of the loan, or up to $2 million, to Atlantis as part of the deal. The kingdom also wanted Palau to sign a number of treaties that recognized Atlantis as a country and essentially set up diplomatic relations. When Palau investigators used a marine law enforcement program to locate the country with the coordinates given by the delegation that visited Palau, “No land mass was shown.” Atlantis was apparently still underwater. Does Andrew have to by a Porsche RS Spyder now?